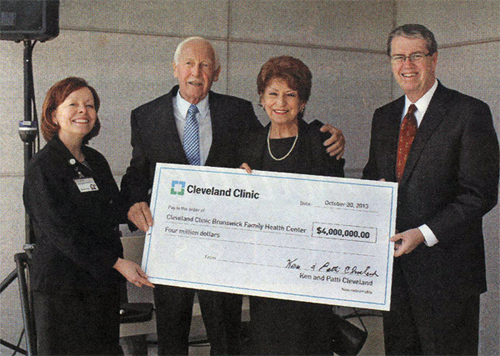 The message contained within that quote, Hinckley resident Ken Cleveland said, is the reason he and his wife, Patricia, elected to donate $4 million to the Cleveland Clinic Brunswick Family Health Center on his 81st birthday. Cleveland, an active philanthropist, entrepreneur and developer in Medina County, started Ken Cleveland Builders in the 1960s and has built thousands of homes in Brunswick, Medina, Hinckley, and Marblehead. He and his wife Patricia established the Ken Cleveland Foundation in the 1980s to make charitable donations to organizations including the Medina Hospital Foundation and the Cleveland Clinic. “We are both so happy to see the Cleveland Clinic growing in Brunswick because we know the entire community is going to benefit because of it,” Patricia Cleveland said during an intimate reception held in the couple’s honor with staff members from Ken Cleveland Builders, Cleveland Clinic and the Medina Hospital Foundation also in attendance. 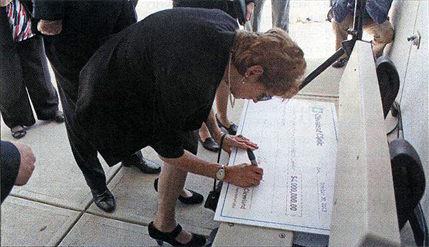 Officials for the Cleveland Clinic said the Cleveland’s donation will be used to support capital projects at the Cleveland Clinic Brunswick Family Health Center, including the expansion of the emergency department, which is currently underway and slated to open in July 2014. Cleveland Clinic broke ground on the Brunswick Family Health Center emergency department expansion this past spring. The $20 million addition will feature a 24,000 square foot, state-of-the-art 24-hour emergency department with a helipad and an additional 20,000 square feet of second floor office space. Currently, the Brunswick Family Health Center offers everything from primary care to specialty care – cardiology, pediatrics, family medicine, nephrology, internal medicine, neurology, OB/GYN, orthopedics, physical therapy, pulmonology, radiology, lab testing and sports health. Ken Cleveland said his relationship with the Cleveland Clinic began nearly 40 years ago when he underwent back surgery. In the years since, he said, he turned to the hospital for care when battling bladder cancer and his wife also benefited from the facility’s services as she continues to undergo treatment for macular degeneration.